The water color was a little funky (grayish) in the Tan-Tar-A area last weekend but I'm not sure it was turning over. Didn't see any other signs. And the water temps were still 71-73 so I think it was too warm to turnover. The earliest I've ever seen turnover begin is Halloween. Typically it begins sometime between then and Thanksgiving. thanks guys. water looked great this weekend, managed three saturday morning over a couple hours. 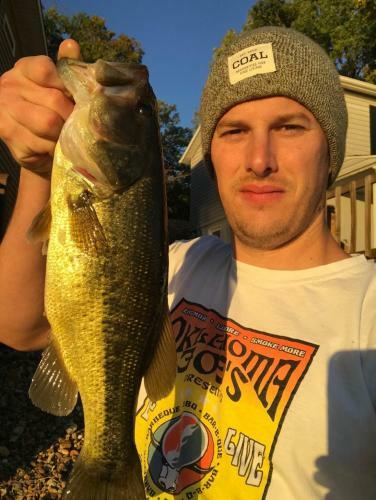 two dinks on a plopper at first light from the yak, and a small keeper from a shallow brush pile under a cable on a jig. family obligations kept me off the water after that, but anyone with a boat and milk run of shallow piles should have done pretty good. I did notice a little froth at the water's edge Sunday morning, wouldn't be surprised if the turnover starts here in a few weeks. The bite was way off this weekend. Took 14 to win DuPo and 17 to win USA bassin Sunday. We had 4 keepers Saturday lost 2 at the boat that were just holing the end of the worm. Even the blue gill and war mouth weren’t hitting the shakey head at the bank. Slothman and I had a go at it in the shallows this evening. In general the action was very slow but we had a few quality bites on a swim jig. I think given a full 6-8 hour day we could put together a pretty solid limit. The first keeper taught us that there's no such thing as "too shallow" right now. I think it's turning for sure now, especially the Osage. Don't you still have a surface temp in the mid 60's up that way ? Truman is dumping and so are we. Lake O is getting a transfusion. I haven't noticed anything resembling a hard turnover. Just a gentle mixing. On the Niangua yesterday temp was 56-58 and the water milky. Looked like turnover to me. Only fish I got were on a Ned fished super slow. I did catch a small Smallmouth, only the second or third I've caught in LOZ.